I followed these instructions to the letter but I’m still confused. It didn’t say WHERE to apply the soap, so I smeared it all over my face and upper-chest area, and then it didn’t say to rinse that part off, so I’ve been walking around all day with soap drying all over myself. GAH. Thanks a LOT, Brawny. I was so confused I ate my hands and carved new ones out of soap! Now, what am I supposed to do with the paper towels again? I thought that’s what they meant for us to do. Were there instructions in the cubicles for how to clean oneself after doing whatever? Come on, toilet paper makers, don’t let Brawny get ahead of you! Next time I’m buying Brawny because that steroid dude is SUPER helpful! I also found some signs with the exact same helpful hints brought to me by Sparkle. I probably saw this same thing in April and had no reaction to the idiocy of it. I think I may be losing my touch, Carrie. I know. Something about public bathrooms that are a wealth of content for me. Maybe I should be worried. You just keep on eating those paper towels! No way The Man is going to keep you down. Of course! I just didn’t know paper towels were so versatile – useful and delicious! Disney World? Did you just win the Superbowl? Congratulations! No, strangely enough I won a Filthy Hands contest! Disney World? You should have tons to write about. 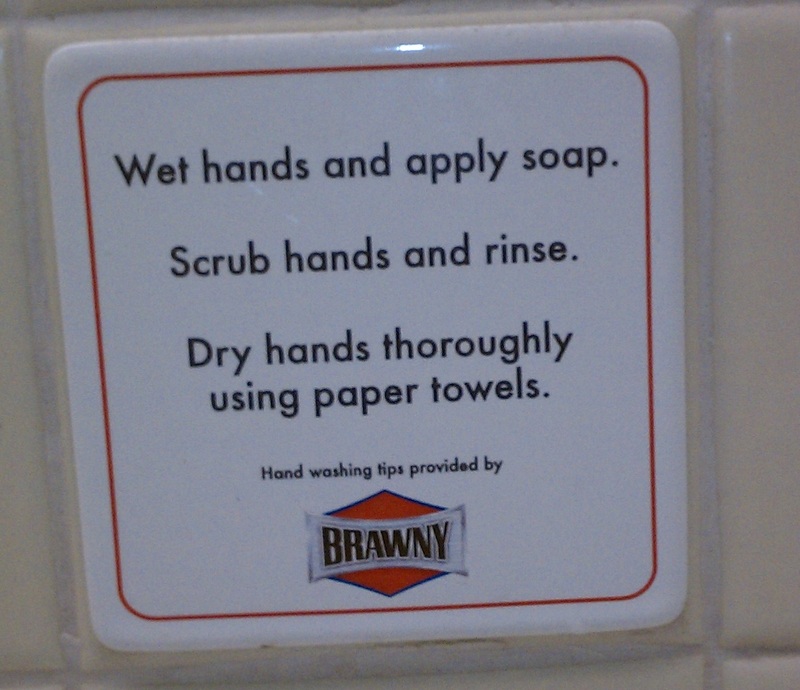 Also, it would be nice if Brawny would just wash my hands for me, rather than try to teach me this complex system. I was also at Disney World in September 2011 and wrung a lot of posts out of that trip, including an incredibly disgusting fellow public bathroom story. Oh, and yeah, if Bounty would SHOW and not TELL, I think we’dd all be better off. Whoa…I thought you used the paper towel first so your dirty hands wouldn’t touch the soap dispenser. Thank goodness you posted this! Next Next post: Big news but hopefully not as impressive as being the host of a previously unknown alien species.